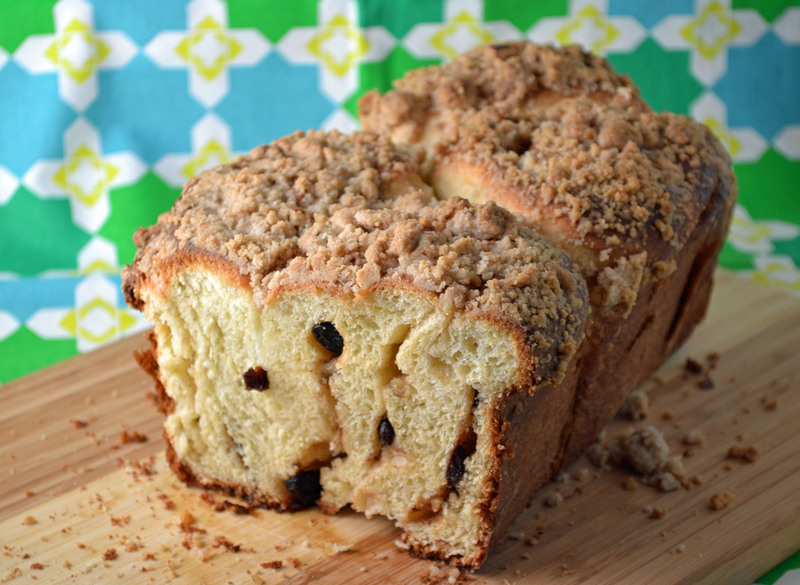 As the winter drags on, there’s nothing like warm cinnamon raisin bread with a buttery streusel topping to start the weekend. It’s surprising that I just discovered this recipe in “The Art of Fine Baking.” I usually never miss a good recipe that involves cinnamon and sugar. In this case, the cinnamon and sugar is layered within the bread and the streusel topping becomes arguably the best part. The simple combination of butter, flour, cinnamon sugar, and walnuts create the crumbly topping that I’m now tempted to use on all many other types of baked goods. There’s something relaxing about making yeast breads from scratch. Kneading the dough to that perfect smooth springy texture is a soothing process. I have used this basic coffee cake dough in other tasty recipes such as Apple Roll, Honey Orange Bread Twist, and even Panettone. It’s a good base recipe but like most yeast breads, it tends to go stale in just a few short days. The best solution for this is to make French toast or bread pudding out of the leftovers. It’s indulgent, I know, but this nutty cinnamon sugar bread with its buttery streusel topping may change how you feel about regular French toast or bread pudding forever. To make streusel topping: Cream butter and cinnamon sugar. Add vanilla and nuts. Add flour, gradually stirring constantly. Use enough flour to make a crumbly mixture. The more flour added, the smaller the crumbs. Set aside. Preheat oven to 350 degrees. Grease to 9x5x3 loaf pans. Roll dough in large square, 1/4 inch thick. Brush with most of the melted butter, and sprinkle with cinnamon sugar, raisins, and crushed pecans. Roll up jelly roll style. Cut roll evenly into six slices. Fit three slices cut side flat into each pan, squeezing them if necessary. Press slices down in pan so that in rising, they will grow together. Let rise until almost doubled in bulk. Scatter streusel topping generously over each cake. Bake in a preheated oven for 45 minutes or until streusel tops are lightly browned. Adapted from “The Art of Find Baking,” by Paula Peck.